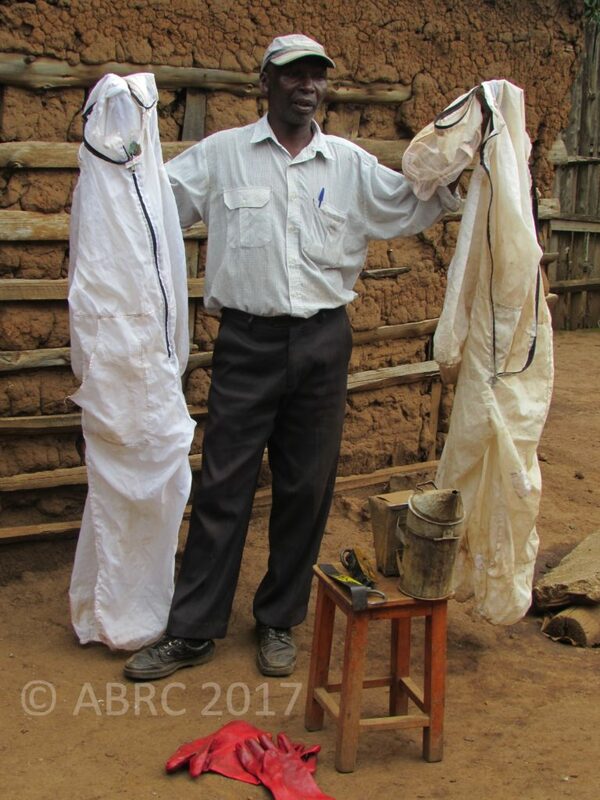 David was selected as a good and progressive beekeeper by staff of the Ewaso Nyiro South Development Authority (ENSDA), based in nearby Narok town. He was proposed because he is one of few practicing beekeepers in the area, can harvest honey and has his own bee suit, and because he also makes his own hives, makes bee hives, harvests honey for others and provides beekeeping training. We met with David, a young man in his thirties, on his small farm (3.5 acres) in Enailbelbel in Narok County, Kenya. 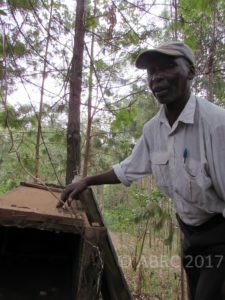 We visited his hives then sat down to chat outside his home – a simple wooden residence roofed with mabati (iron sheets). The area is hilly with scattered clumps of trees. 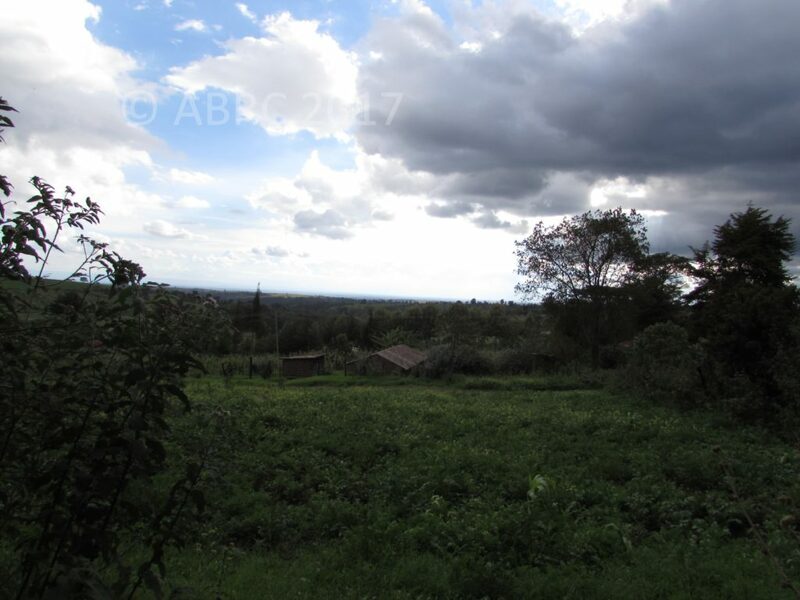 It was evident, from the tree species, that the area was recently part of nearby Mau Forest (which can be seen across the valley from David’s home). From his farm, you can also look down towards the lower and dryer parts of Narok (which extends to the horizon). David is married with three children – a boy and two girls. He gives his children a spoon of honey every day as a medicine. David Tisempele is one of the few practicing beekeepers in his home area, and therefore stands out in his community. He has a passion for bees. He only recently began beekeeping (in 2013) and has done well in just two years. Beekeeping product sales have earned him enough money to buy a motorbike; 90 people visited him from UNEP (the UN Environment Programme headquarters in Nairobi); and now he is planting trees for his bees. David wishes to make his living from bees and to focus on the enterprise. 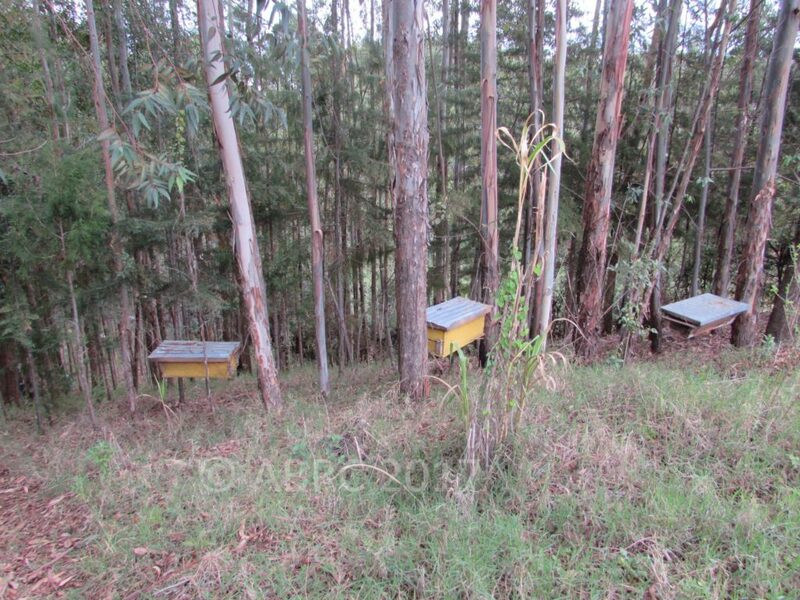 He completed a three-week residential training course at Baraka Agricultural College in Molo, doing an introductory course on beekeeping and learning to make hives and beekeeping equipment. His training was supported by ENSDA as part of ENSDA’s project to conserve Mau Forest. He wants to make more and more of his living from bees. As well as keeping and collecting them, he makes and sells bee hives, and trains other people to manage their apiaries. He seems a pretty good businessman, and has increased to eleven hives – nine top bar hives and two frame hives (Langstroths). Bees and beekeeping are clearly an investment for David. He’s in this for the money but he also enjoys the work. David bought the motorbike with his beekeeping income and sees this as a reinvestment. He is also good at networking and linking with other beekeepers (and recently visited Embu to learn about stingless bees). 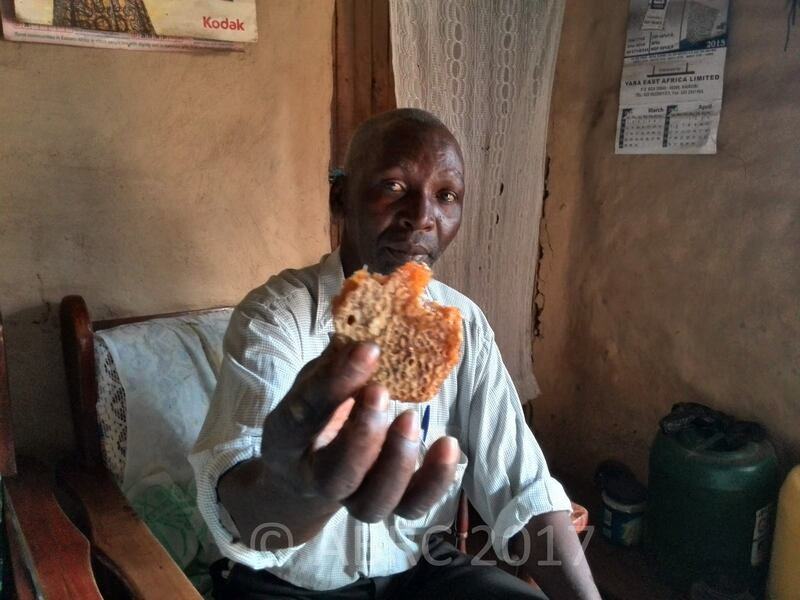 He sells honey at Ksh.500 per kg (€4.54/kg) in soda bottles. He sells honey for making ‘Miti ni Dawa’ which is a type of herbal medicine/alcoholic beer made from honey fermented with herbs. At the time of the visit David had an order for 50kgs of honey to make this drink. He sells KTBH hives at Ksh.3,000 and Langstroth hives at Ksh.4,000. He sells bee colonies for Ksh.4,500. 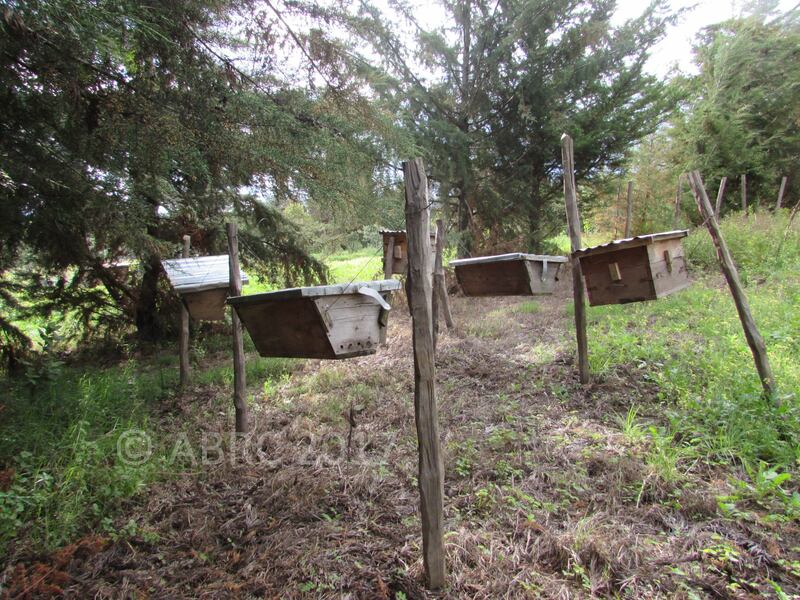 He stocks beehives for other people for Ksh.2,000. 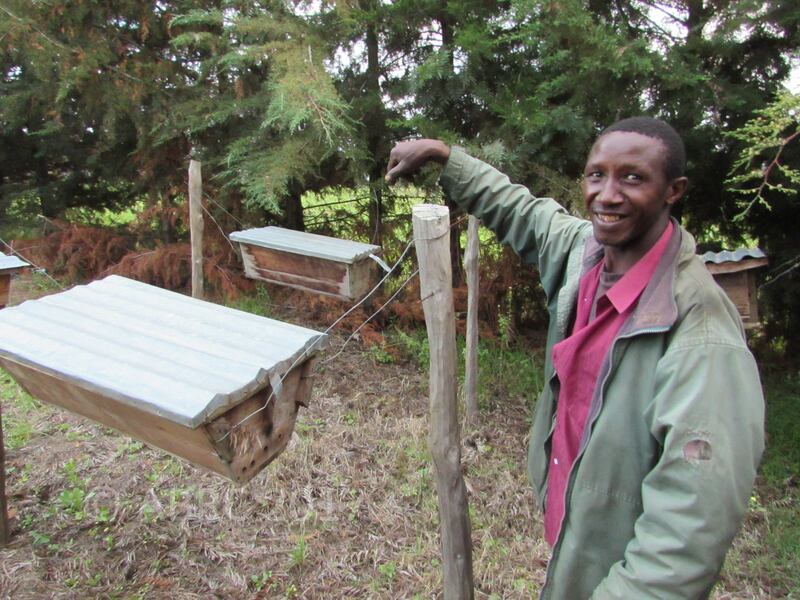 He provides beekeeping training at Ksh.200 for an hour, or Ksh.1,000 per day. David observes his bees every day to make sure everything is OK. He checks to make sure the hives’ lids are on, and looks for any signs of attacks by pests. David opens his hives monthly (in the daytime after taking children and animals away from the area). He says the bees become calm again after about ten minutes, and believes that more frequent opening makes bees more docile. When he opens hives, he checks for pests and to make sure the queen is laying well. If he finds that bees are unproductive he kills/forces them to abscond. His believes that small colonies continue to be small and produce nothing. He is passionate about bees and beekeeping. He is treating beekeeping as a business. He is very entrepreneurial and maximises income from bees in several ways by: selling hives, selling honey, providing training and stocking hives (giving a discount on hive-stocking if customers buy the hive from him as well). He reinvests some of his income to increase his beekeeping business. He inspects his hives regularly (checking his apiaries every day and opening the hives monthly). He gets rid of unproductive colonies with poorly performing bees. He transports bees on his motorbike, wrapping the hive in a mosquito net. He plants trees for bees around his home and farm. He has a tremendous interest in bees and would benefit from and use further training on beekeeping (as he is a trainer of trainers).